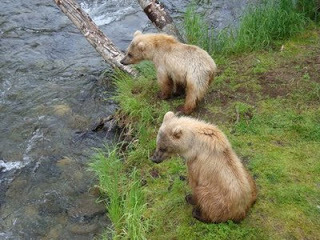 A little background: Brooks Camp, in the Katmai National Park, boasts the largest concentration of brown bears in the world. Kodiak Island is just offshore. 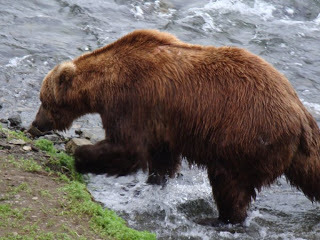 Grizzlies and brown bears belong to the same species, but Alaska’s coastal brown bears are bigger than their inland kin because of their protein-rich diet of salmon. Brown bears can weight up to 1,500 pounds. Everything that comes into Brooks Camp, including food, supplies, and tourists, comes by water or by float plane. Our plane from King Salmon was of early ‘60s vintage; it had been owned by the United Nations, Saudi Arabia, and the French Canadian Air Force at one time or another, and it had an adventure-worn aura about it, like something out of an Indiana Jones movie. 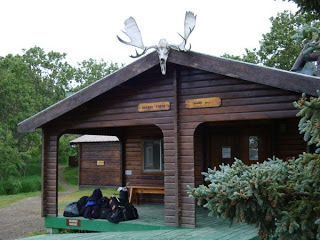 The camp consists of a gift shop, a small lodge with a bar and a dining room, and 16 cabins. I went to the shop right after we registered and bought an extra sweatshirt and a mosquito net that fit over my hat. I had already gone through my bags and found a thin pair of pants that I could wear as an extra layer under my sweats. Much better. You could tell from the accommodations that the place was originally built for fishermen; each cabin had four bunks with a sink, toilet, and shower across the back of the room. A curtain was rigged to provide a dressing area with a bit of privacy, but other than that, it looked like a typical fishing camp. News clippings from the 1950s on the walls of the lodge showed lots of pictures of fishermen showing off their catch with nary a bear in sight. Captain Mike, from the Kahsteen, who was a park ranger at Katmai in its early days, told us that the bears were just a nuisance back then, before they became the main attraction. 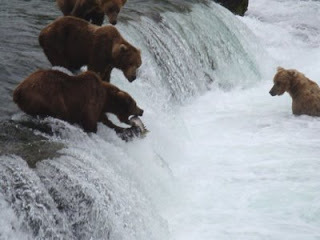 The bear population in the Katmai Preserve is estimated to be 2,000; 80 adults were documented as living at Books Camp, in addition to probably that many cubs and juveniles. The camp is situated beside a river and a lake where the salmon run in July and again in September. 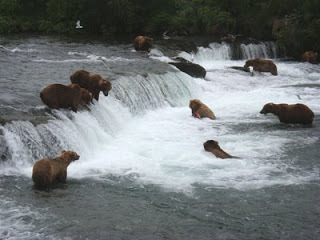 If you have ever seen pictures of bears catching salmon at a waterfall, chances are you have seen Brooks Falls. Raised platforms near the falls and overlooking the lake allow people to get a close-up view; the bears seem to take little notice of them, in spite of the fact that the platforms are only elevated a few feet overhead. The bears could walk right under the viewing platforms. This shows how close they were. As I was waiting in front of the lodge before dinner, a bear came up the path and almost onto the porch. One of the rangers ran toward it, shouting, stomping her feet, and spraying pepper spray into the air. The bear slightly altered his path and ambled on, but didn’t come up on the porch. We got up the next morning to find a bear resting just outside the front door of our cabin. We had to wait until he left before going out. Later, my husband ventured out alone and got stuck on a bridge for 20 minutes with bears at both ends. Another time we were on our way to hear a talk when a large bear stuck his head up out of the grass by the trail, so we had to back away and find a different route to the auditorium. If a bear wants the path, he gets it. Brooks Camp runs on bear time. 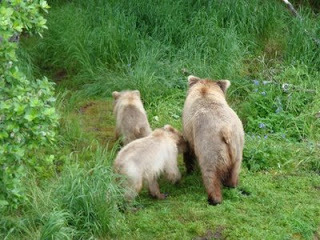 The biggest males claim the best fishing spots while the females with cubs stay a safe distance downstream. The males will kill and eat even their own cubs, so the females are ever watchful and wary. We counted 13 bears at once from the viewing platform at the falls, and we witnessed an altercation between a mother bear and a boar who got a bit too close. 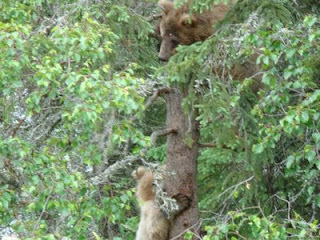 While we watched, two cubs scampered up a tree right beside us, much to the delight of the photographers in the group. Sometimes the fish wins. This one got away. Bears are not really very good at fishing. The ranger showed a film of a wolf walking out of the forest, snatching up a big fish, and walking away while the bears sat wistfully peering into the water. I could sometimes hear the theme from Jaws in my head while we were at Brook’s Camp. There was a level of stress that was evident even in the staff, but there was also the kind of exhilaration that comes from facing danger. I remember Sam Neil’s line from Jurassic Park: “They’re animals, they do what they do.” And there seems to be something in our nature that makes us want to run with the bulls, swim with the sharks, and watch the animals doing what they do. 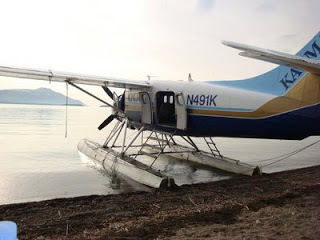 Brooks Camps, Float Plane, Lots of bears. Bookmark. (Great diet enforcement—Warning! Anyone eating between meals will be eaten.) I burst out laughing when I read this! Haha, thoroughly enjoying reading…can’t believe the number of bears and that you were not more frightened. We lived amongst them in the forests of British Columbia for 6 years, but I never lost my fear. Sometimes we would see one drinking out of our water fountain. Another time, a young bear sat amongst two garbage bags he had opened and was going through it – munching and throwing away stuff. My sons grabbed there bazooka water guns and shot him, until he ran up a tree. I say ran because that’s what it looked like. They are lightning fast! Someone said they spotted a Grizzly once and there were several mountain lion sightings, even in our neighborhood. ROFL This applies to my husband, Ian, as well: “but I suffer from what I call the all-you-can-eat syndrome. When everything is included in the price, my will power is in conflict with my natural tendency to want to get my money’s worth.” Too funny! You may be right about that. 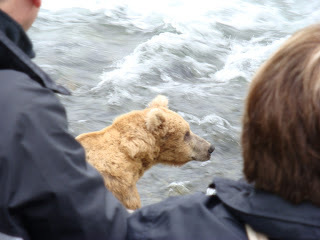 I was certainly not guilty of getting too close to the bears, but they had no rules about how close they came to me!